The Northrop F-5 " Freedom Fighter" was conceived as a response to the ever-increasing complexity and size of fighter aircraft as the 1950s drew to a close. Developed during the early 1960s, the F-5 was selected for the United States' Military Assistance scheme, and found its way into service in many of the smaller Western-alligned Air Forces in the late '60s and early '70s. The RCAF selected it for use in the ground attack and lead-in fighter training roles in 1967. It served faithfully until the early 1990s when, in typical Canadian Government fashion, the freshly upgraded fleet was unceremoniously retired and sold off. This set represents two variations of 419 Squadron's colour bird "Bruce the Moose", so named after the squadron's mascot. 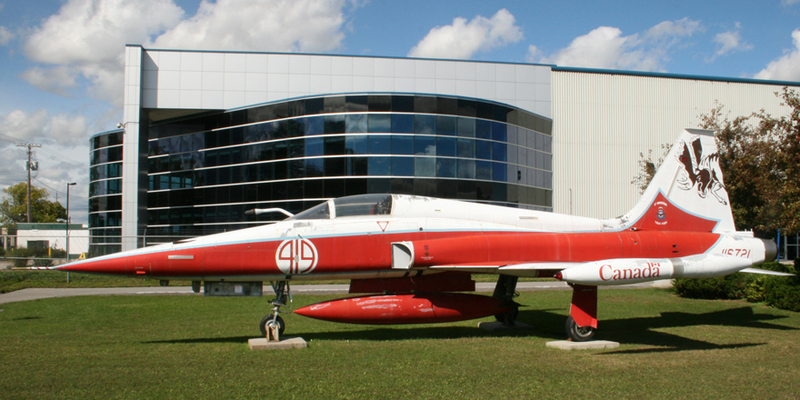 16703 is portrayed as it was in 1989, and 116721 as it may be seen on display at the National Air Force Museum of Canada at CFB Trenton. There are two sheets in this set. The first sheet contains the fuselage stripes, tail markings, portions of the underwing markings, and red pieces shaped to fit the speed brakes and main wheel doors. Stencils and "slime lights" complete the sheet. The second sheet has the lower centre fuselage portion of the underside maple leaf, and the upper wing and tailplane markings. Curved blue outlines for the rear fuselage marking complete this sheet. The instructions come on one 8 1/2 X 11 sheet printed in full colour. It shows top and bottom, left and right side views of both subject aircraft. The top and bottom views are split in half so care needs to be taken when following them. This decal sheet is available for purchase directly from Canuck Model Products' website. The site mentions that this is a "very limited run" sheet, so don't hesitate too long if you want to buy it. Highs: A comprehensive decal set which will allow for two variations of 419's pride and joy. Verdict: Fans of the RCAF's birght and colourful celebratory aircraft will find this one irresistable.